Adam has been in the Auto industry for over 15+ years while also serving in our US Armed forces and attending PGA School in Myrtle Beach right out of High School. Adam loves to be at Eagle Motor Company assisting current and future clients, yet we all know he day dreams about the links. After work he then rushes home to his Wonderful Wife and Daughters. Carolyn started with Eagle 11+ years ago with a wonderful story of a 2 week agreement between herself and Chuck's father Norman. Needless to say the agreement was mutually effective. The relationship even goes further than Eagle. Apparently Carolyn and many Eagle partners cannot get enough of each other because on Wednesdays and Sundays they attend a local Church together. Eagle Motor Company was founded by Chucks Father which started this company 30 years ago and eventually passed the business on to him. The true glue of the company is actually standing beside him though. Pam Epler is Chuck's lovely wife who has been working along side of him for the better part of the last decade. 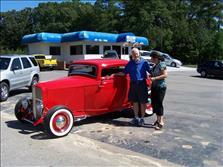 Chuck can often be spotted on Saturdays before and after work cruising in his '32 Deuce Coupe. With permission of course (hehe). A true example of a genuine car guy! Cory started in Manufactured home sales in the late 90's at the ripe old age of 19. Realizing that the industry had took a turn. Cory had to make a decision as to whether to stick with sales or join the Air Force like his father. Bumping into someone and acquiring an interview just days before meeting with a recruiter. Working his way up through the ranks in Franchise Auto Sales for the last 16+ years. By the Grace of God Cory joined Eagle July 2016. Joey has been a fixture in the Car business for the better of 3 decades. Starting with a family owned parts business then eventually working his way up the latter at local franchise facilities. Joey can often be spotted on every interstate in the South East looking for a good Pre-owned vehicle, or at a local river, lake, or stream fishing with his family. Since Luke was old enough to hold a wrench, he was under the hood of a car with his father. Luke's career as a Master Tech began almost as early. His list of certifications are so vast that the walls in Eagles Service dept could not hold. Known as more than just your basic mechanic we all assume dealership technicians may be, Luke has clientele as vast as States away that seek his advice and his craft on every possible make and model. His extensive following is a testament to not only his Automotive skill set, but his overall focus on customer service. Luke, Chuck, and Joey met the better part of a decade ago and all three feel just as blessed today for one another as they did back then. Nelson has been a long time friend of the Eagle family since he decided to step away from his entrepreneurial ventures in Charlotte, NC where he opened and closed several businesses along with a stellar career with the upper levels of Alltel Inc. Nelson has been a fixture at Eagle for 5+ years and shows no sign of slowing down owning a work ethic few of us posses or obtain. Tammy is an absolute success story! From humble beginnings in S.C., to one of the most sought after Parts and Service Experts in the business. Since the start of her career in a male dominate industry, Tammy showed and continues to show that if you put your mind to something there are no boundaries. Growing up through the family business, Tammy learned the ins and outs of the ever evolving automotive industry at a very young age and continues using that knowledge to assist the clients here at Eagle. If anyone notices Tammy's similar last name to Joey's, its because they are siblings. From the moment you step on our lot until the time you drive away in your next car, your buying experience with Eagle Motor Company is our number one priority. We encourage you to use the expertise and resources of our sales staff; they are here to help you find the right car at the right price. Call us today at 910-867-8585 to schedule your test drive!